Southern Thailand's Phuket island is an upscale destination rich in small, elegant tropical resorts. The unique Keemala is one of Phuket's best hotels. It opened in late 2015 and is now celebrated by travel awards and guest reviews. Keemala is a high-design hotel where everything you see is a delight to the eyes. With 38 accommodations plus a spa, restaurant, gym, and bar, Keemala provides its guests with a complete resort experience. But visitors also bask in the private-feeling mood of a boutique hotel, with warm, one-on-one service. This family-owned hotel, named for Grandmother Kee, overlooks Kamala Bay and Kamala Beach. It appeals to sophisticated, health-conscious couples seeking a romantic retreat plus fine cuisine and wellness options. Quite a few newlyweds choose Keemala for their honeymoons. You can find out more about this one-of-a-kind getaway in the resort's inspiring story and on Keemala's Small Luxury Hotels page. Or keep on checking out Keemala right here to see if it could be your ultimate Thailand vacation. Keemala offers guests four styles of accommodations, each architecturally distinctive. The seven Tree Pool Houses are the hotel's most popular. Their two-story design honors an ancient Thai tribe who built their dwellings in two floors raised off the ground on stilts. The first floor of the Tree Pool Houses have a good-size pool, deck, living room, and dining area. Upstairs is a bedroom with a king or two twin beds (see the bedroom in the next slide). If you've been waiting your whole life to sleep in a treehouse, here's your chance. Make that a luxurious treehouse. Keemala's eight Bird's Nest Pool Villas are sheathed in open woodwork that resembles twig nests, and they are indeed ideal for nesting. They feature a spacious bedroom with a king bed, a living area, indoor-outdoor bathroom, terrace, and pool big enough to swim laps in. Bird's Nest Pool Villas offer a view of the surrounding rainforest, and some furnish glimpses of the Andaman Sea. 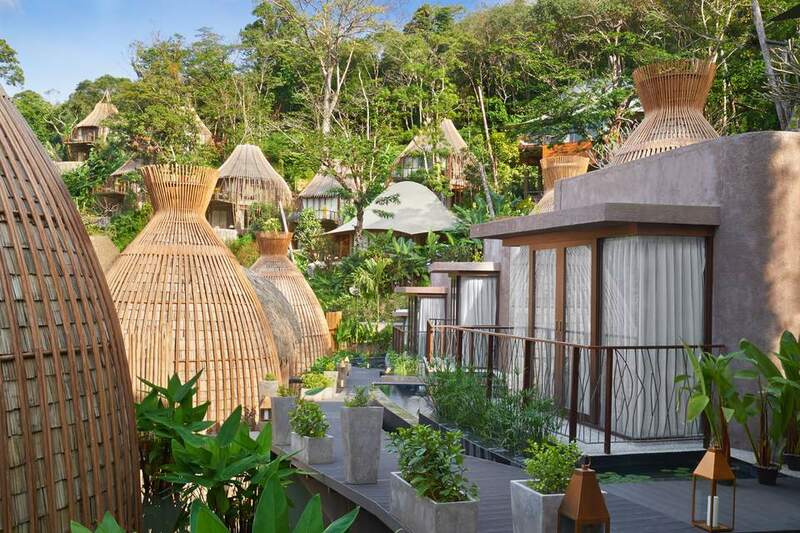 Keemala's seven Tent Pool Villas were inspired by Thailand's restless nomadic tribes. The roof is tent-shaped, and the king bed is mesh-draped, inviting cocooning. The spacious bathroom beckons with a monsoon shower plus an outside shower and a bathtub built for two. Tent Pool Villas offer a good-sized private pool and views of the rainforest or the resort. Keemala's 16 Clay Pool Cottages are a tribute to Thailand's traditional Earth clan, who worked the land as farmers. The cottages are rich in natural textures, tribal designs, and handcrafted accents. These spacious accommodations have one bedroom or two bedrooms for families or girls' or guys' getaways. Luxury travelers with a passion for over-the-top hotel bathrooms will love lounging in Keemala's. They are sprawling indoor-outdoor spaces beautifully done in local wood and stone. Indoors you'll find a standalone soaking tub, a walk-in mosaic-tiled shower, twin sinks, an ample closet area, a vanity table and seat, and a partitioned toilet. Outside is another shower that is open-air yet fully private. Keemala's bath potions are organic and the robes and slippers super-plush. Lounging in these bathrooms is a pure pleasure. Keemala occupies a hillside overlooking Kamala village, with a view of Kamala Beach a couple of kilometers away. While guests have ample access to the beach via hotel transport, Keemala is not at heart a Phuket beachfront resort. Most Keemala visitors come here to relax with their partner, or to work on their well-being, or to commune with nature, but frolicking on a beach with other sun-worshipers is not their #1 goal. Still, guests who love the water will be delighted with the pools at Keemala. Every guest villa has its own private pool that is closer in size to a swimming pool than to a plunge pool. And Keemala has a large resort pool that is open to every guest, with food and drink service and a soothing, lazy vibe. Yes, every Keemala guest has a private pool. But Phuket is famous for its beaches. And guests have easy access to one of Phuket's most serene strips of sand, Kamala Beach, a couple of minutes away. The resort will bring you there and pick you up free of charge. And if you and your travel buddy are in the mood, they'll set you up with an unforgettable ​beach picnic for two. Guests who come to Keemala hoping to stay active can do so. And those who want to spend time lazing around a pool can do that, too. The resort's pool, shown here, complements the private pool featured in every one of the 38 guest accommodations. The resort pool offers butler service, drinks, and a full snack menu from the Cha-La Pool Bar, and it never runs out of lounge chairs. Keemala's reception room lets arriving guests know right away that this is unquestionably a design hotel. This beautiful room is emphatically modern yet richly decorative and organic in feeling. Such is Keemala's signature look, and it seduces design-conscious guests. See more of Keemala's high style in the resort's photo gallery. One highlight of a stay at Keemala is the resort's fresh and delicious cuisine. Its Mala restaurant serves breakfast, lunch, and dinner. This versatile kitchen prepares many menu options, and the chefs are versed in both Western dishes and traditional Thai specialties. (If you were hoping to indulge in Southern Thailand's exotic curry dishes, Phuket is indeed the place.) All ingredients are natural and additive-free, and many are grown in the resort's organic garden. Mala's staff welcomes special requests, whether for gluten-free dishes or lunches to bring to the beach. Room service is round-the-clock. Find out more about the culinary life at Keemala. Mala's wine list is one of the most extensive on Phuket, and there's a sommelier on hand for choosing a wine or course-by-course wine pairings. The handsome Wine Bar hosts Keemala guests and other Phuket vacationers for wine sipping, tasting flights, and wine-paired dinners. Mala's bar custom-makes creative and classic cocktails, all with a subtle tropical touch. If you're curious about Thailand's new specialty liquors such as rum and lychee vodka, you can taste it here. The beauty and comfort of Keemala guest villas could tempt you to laze there all morning. But if you do that, you'll miss Mala restaurant's stupendous breakfast. It's both a la carte and buffet-style, offering Thai and Western ​dishes, and a rainbow of locally grown fruits and fresh-pressed juices. What a way to start your day. Keemala guests tend to marvel that the dishes served here are flavorful yet light. And some commit themselves to bringing the food home--in the form of kitchen skills. The resort's Culinary Academy grounds you in the ingredients and techniques of healthy Thai cooking. Home-cooked curry may not be an impossible dream. Keemala attracts fitness-conscious guests with varied offerings for body and soul. The resort's well-equipped gym is open 24 hours, with both complimentary and private fitness classes including Muay Thai kickboxing and several styles of yoga (done indoors and out). Keemala is getting a name for its customized wellness retreat packages. The resort offers four types of holistic wellness programs for individuals or twosomes. Purify is dedicated to mind-body balance; Energise focuses on fitness; Unwind aims to de-stress; and Rejuvenate is a body-and-soul spa program. Find out more about Keemala's retreat packages. Mala Spa is like everything else at Keemala: classically Thai with contemporary flair. At this appealing small spa, expert practitioners finesse the arts of Thai massage, Thai healing, and Thai beauty. These spa rituals are not only relaxing and beautifying. They are results-oriented, and bring you closer to relaxation, rejuvenation, or perhaps a smaller silhouette. And you'll walk around with a visible "spa glow." Find out more about Mala Spa at Keemala. Keemala is set amidst nature. Birds sing. Tiny lizards scurry past. And water buffaloes make the rounds, announcing their majestic presence with their bell collars. These graceful creatures are beloved Thai farm animals, and some Thai resorts have made a tradition of keeping a family of water buffalo on the property. They are faithfully tended and paraded around daily, seeming to pose for photos. Keemala also shelters water-loving ducks, flashy peacocks, and adorable baby goats ("kids"). The ducks contribute their free-range eggs to Keemala's kitchen pantry; ask your Mala restaurant server if the ducks have been a-laying. Do you miss your pets when you travel and/or love the idea of resident animals? Here's a gallery of hotel pets around the world. Phuket has become a magnet for destination weddings and honeymoons, and Keemala is chosen by ultra-stylish couples as the place to celebrate their union. Truly, love conquers all. In love with Keemala? Check out this one-of-a-kind place on the Web, on Twitter, on Facebook, and on Instagram.